Fermentation Tasmania, as a not-for-profit company, has appointed a highly skilled CEO and Board to lead this project. Kim Seagram (Chair): Co-owner of Stillwater & Black Cow Restaurants, co-founder of Harvest Launceston. Peter Schutz: Chair, Food Innovation Australia Ltd. Individuals and businesses from Tasmania's fermentation industry have been involved in advising Fermentation Tasmania since day one. 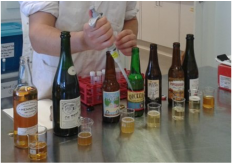 Company investment - Contact Kim Seagram or Pip Dawson for details on corporate investment in Fermentation Tasmania.